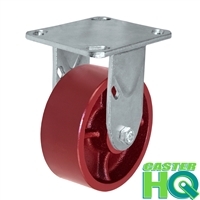 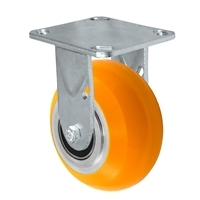 Home > PLATE CASTERS > Capacity up to 1,500 lbs: - 4" thru 8" Wheels - Plate Size: 4-1/2" x 6-1/4"
This series class is one of Caster HQ's most recognized and commonly used casters in a broad spectrum of industries and is one of our most popular selling caster series; offering exceptional quality, functionality, value and availability! 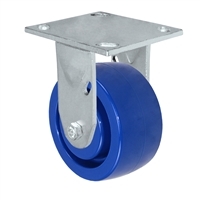 To offer fast delivery and competitive prices, we mass produce and stock all the parts required to quickly assemble these high quality casters to your desired specifications. 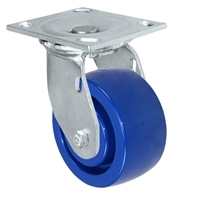 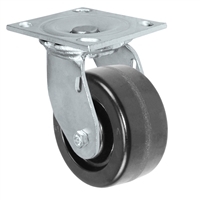 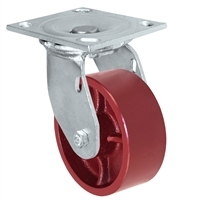 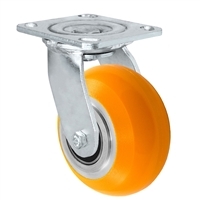 This series is made from 1/2” thick cold rolled steel; designed, formed and welded for optimal mobility and made to withstand the rigors and abuses typical for medium duty caster applications. 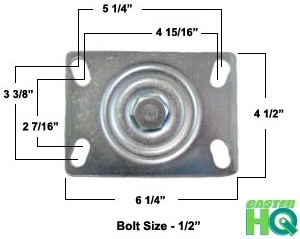 Double ball raceways and a 3/4” heat treated nut & bolt kingpin are standard features. 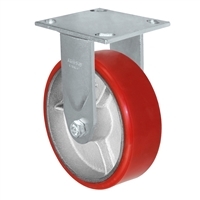 4" x 2" Red Ductile Steel Wheel - Rigid Caster - 1,500 lbs capacity - Plate Size: 4-1/2" x 6-1/4"
4" x 2" Red Ductile Steel Wheel - Swivel Caster - 1,500 lbs capacity - Plate Size: 4-1/2" x 6-1/4"
4" x 2" Solid Polyurethane Wheel - Ridid Caster - 800 lbs capacity - Plate Size: 4-1/2" x 6-1/4"
4" x 2" Solid Polyurethane Wheel - Swivel Caster - 800 lbs capacity - Plate Size: 4-1/2" x 6-1/4"
5" x 2" Red Ductile Steel Wheel - Rigid Caster - 1,500 lbs capacity - Plate Size: 4-1/2" x 6-1/4"
5" x 2" Red Ductile Steel Wheel - Swivel Caster - 1,500 lbs capacity - Plate Size: 4-1/2" x 6-1/4"